Description: The mind-stretching, creative-writing activities in these books were designed to correlate with the science curriculum. Each book contains 21 different topics, each with background information and four writing activities. 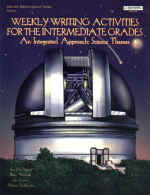 Among the topics covered in the Intermediate Grades Book are Food Chains, Simple Machines, The Human Body, Volcanoes, Weather, Sound, Magnetism, Telescopes, and Oceans.